Hi all ~ just a quick note to let you know that I will be a vendor at the show at Malabar Farm this Saturday, September 27 from 10-4 p.m. I made a decision in the Spring to bow out as we just came back from vacation Tuesday night and I thought I would be too tired. But, I'm ready to roll and there was a place for me to squeeze in so ~ come see us all! 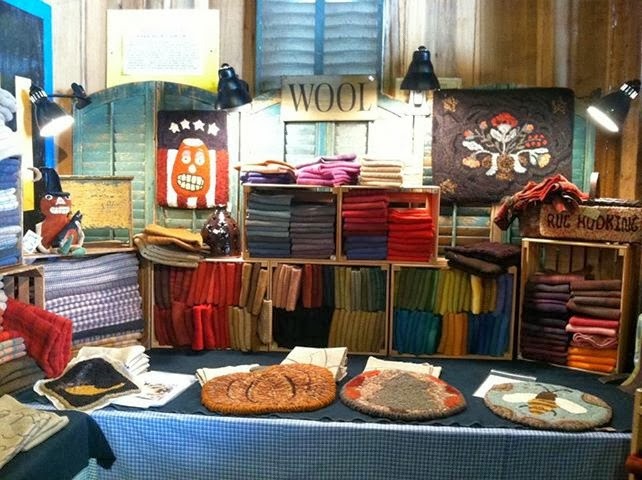 Lots of antiques, folk art and wool for your shopping pleasure!!! Nothing better than a show on a sunny fall day down in the Pleasant Valley!!! Kris Miller was our illustrious teacher and these are the four patterns we chose from. They are darling in person ~ and so is she!! Posting from my phone isn't very much fun so I will post when I return to Ohio!! It was a great trip ~ we loved it!! We took a bus tour of the city of Juneau and the Mendenhall Glacier today! A telephoto of the glacier ~ it's blue ~ icy blue! We took a two mile round-trip hike to Nugget Falls ~ 34 years ago it was covered by the glacier ~ global warming is a real thing!! We had a wonderful driver/tour guide ~ Archie ~ a Tlingit Indian ~ so interesting and informative! It is a privilege to be able to see the glacier and this land of some real pioneers! Pretty rugged territory! On the Grand Princess ~ Princess Cruise Lines! Our mini suite is pretty comfortable and of course, comes equipped with a cabin boy! Wonder if he'll come home with us?! Our view leaving the Port of Seattle on Sunday morning. The view from our balcony at 6 am this morning!